If this Maplewood History blog were a wagon it would have been stuck in a rut for about the last month. The touch screen on my Lenovo All-in-One computer began to act up about the beginning of April. Thus started a chain of events that I won’t even try to repeat here. Mostly I just want to forget them. That computer would have been two years old this November. Needless to say it was out of warranty. The touch screen eventually malfunctioned so completely that not even the experts at the Micro Center could get past it. It rendered a once great computer useless. I have replaced it with a Dell laptop and if it doesn’t get a lot faster pretty quick I’m going to have to take it back to the Micro Center folks as well. Enough of my problems. If you own a computer I’m sure you have many of your own. 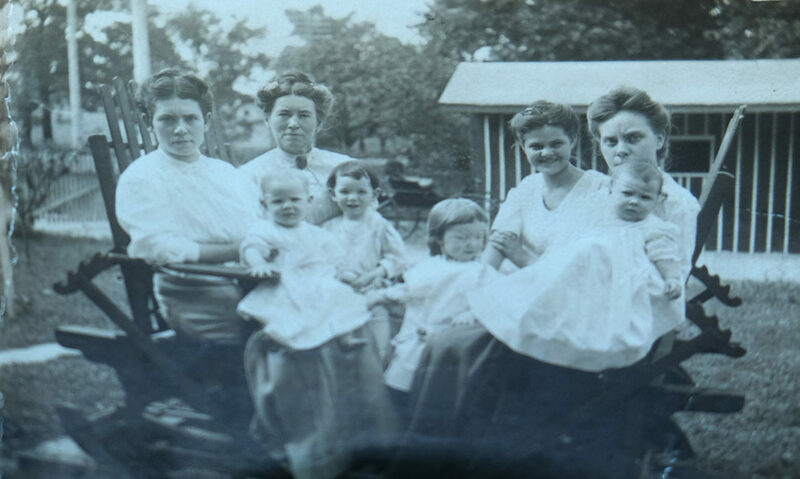 I came to an appreciation of old photos of Maplewood families in a roundabout way. First I was curious about the old buildings. I didn’t think much about the families that had once lived and worked in them. In 2008 I put together our community history book for our centennial. For the first time I took a hard look at the people in the photos. 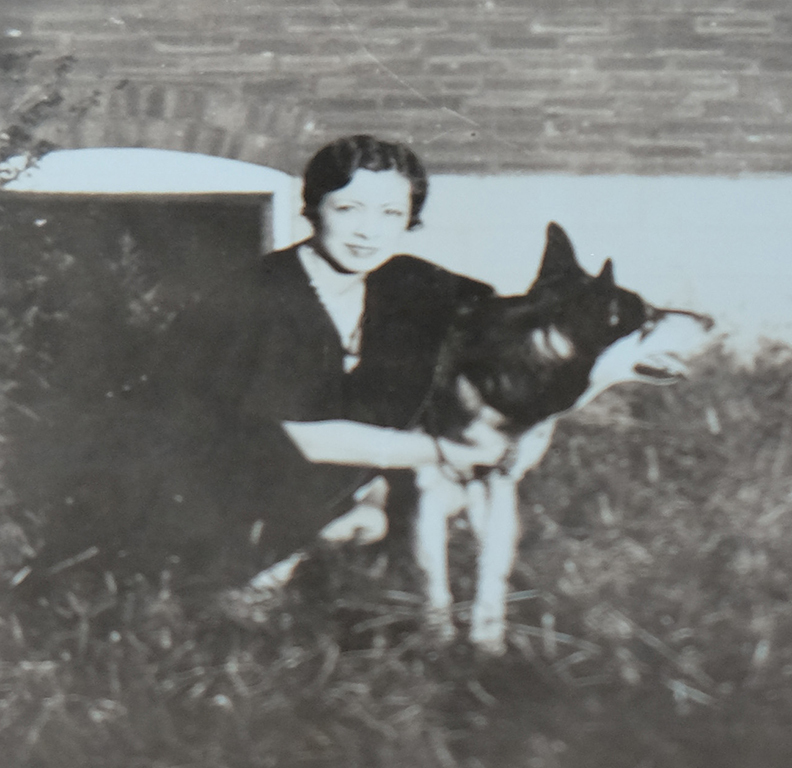 Even met some of them – like Millie Durban and Elmer Wind Jr. The photographs that they kindly shared ignited my interest in the people in them. For about the last 8 years or so I’ve posted a lot of them in my blogs and before that on the City of Maplewood’s Facebook page. It seems that the more of them I see the more interesting they become to me. Even though they are no kin to me they seem like my ancestors. I think they are in a way. As one of my readers commented this story of Maplewood is the story of America. He’s right. I never thought of it that way until he said it. Last December Larry and Jean Wiss McDaniels were kind enough to let me copy their family photos. 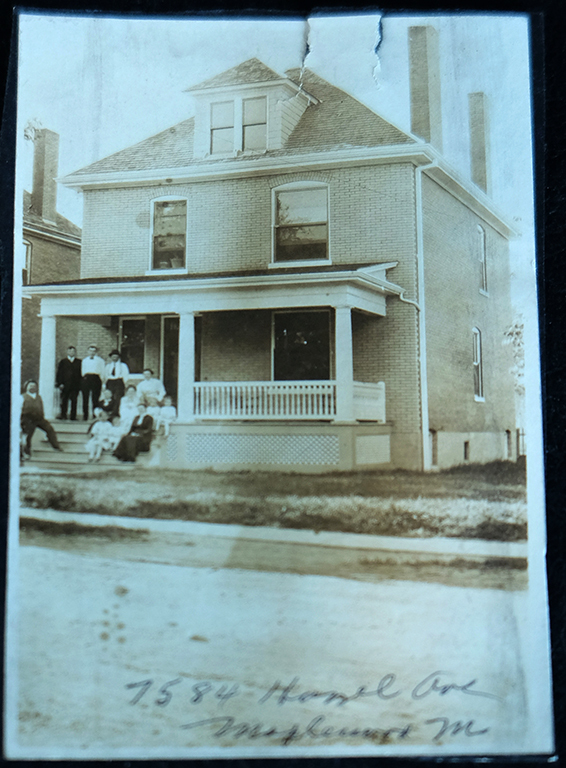 The Wiss family once lived on Hazel in a home that is now gone. The memory of their time in residence there would be gone as well were it not for these photographs. I hope you enjoy them as much as I do. Much thanks to Larry and Jean for sharing them with us. 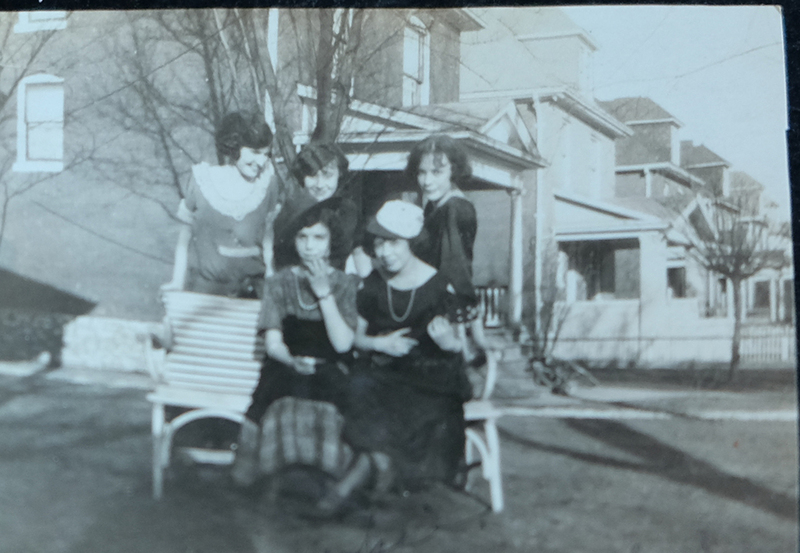 These girls shown here on the front steps of the family home are a bunch of cutups. See what I mean. They’re just having a good time. My photography mojo was a bit off the day I took some of these images. Blame me for the fuzziness. The McDaniels have some fine old photos. This image gives us a view of some of the other homes on the block. I haven’t checked yet to see which ones are still there. 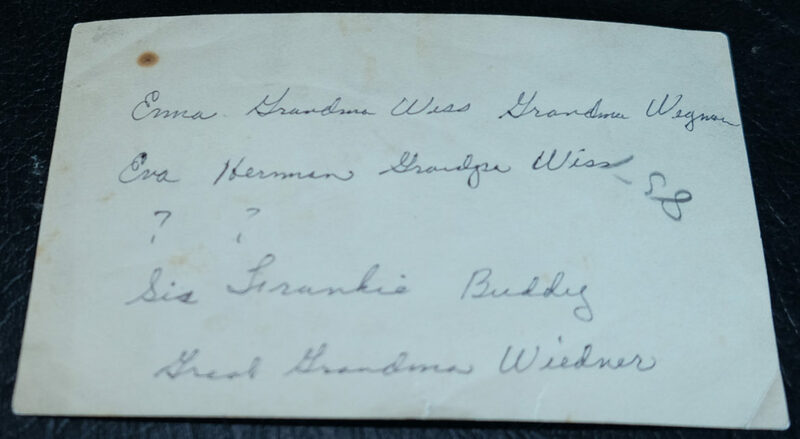 The information with this image reads Grandma Jennie Wiss and maybe Sally Pare. The horse is Dolly. The location is at the home pictured above. We just had an image for the horse lovers now here’s one for the more mechanically minded. Don’t know who is in the machine or where the location was. The type of border was popular in the 1930’s. 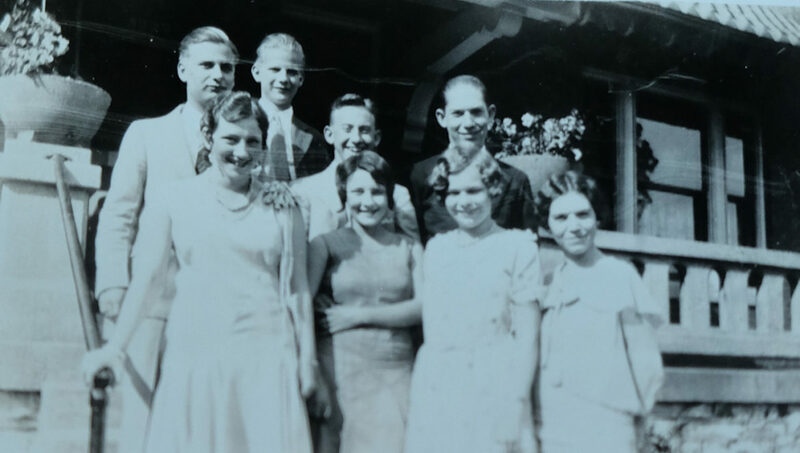 Some unidentified youngsters in front of what looks like the family home. 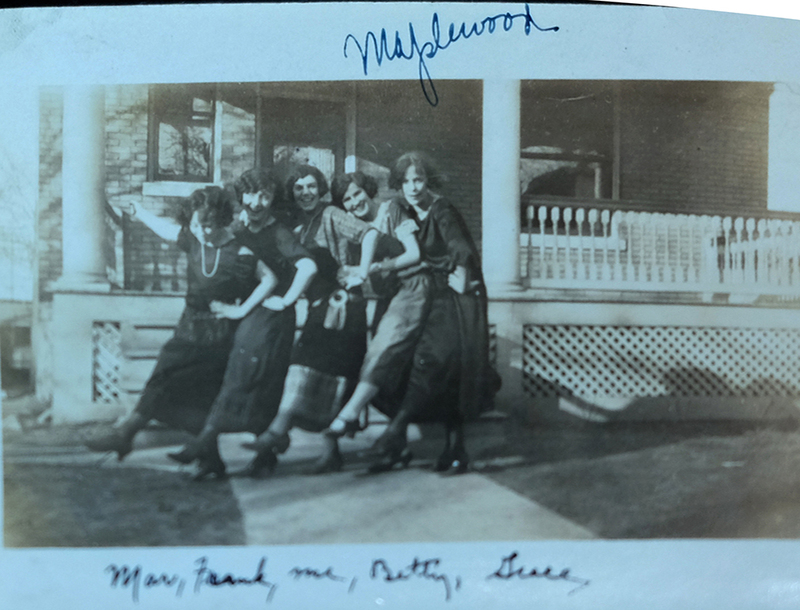 Perhaps it s an earlier image of those older girls in the first photos? Who are these people? See the next image. If you wonder why I post the backs of some of the photos sometimes there is interesting information there. Mainly it easier for me than retyping all of these names. A nice looking studio shot. Identities next photo. This lady and dog are at the house on Hazel. Some folks have told me they enjoy seeing the outfits people are wearing in these old images. Explanation of the previous photo. You’ll notice that the location of these unidentified characters has changed. The address 3316 can be seen on the left. I believe Jean said this was on Commonwealth. How about this handsome group. Were they also on Commonwealth? I don’t know. 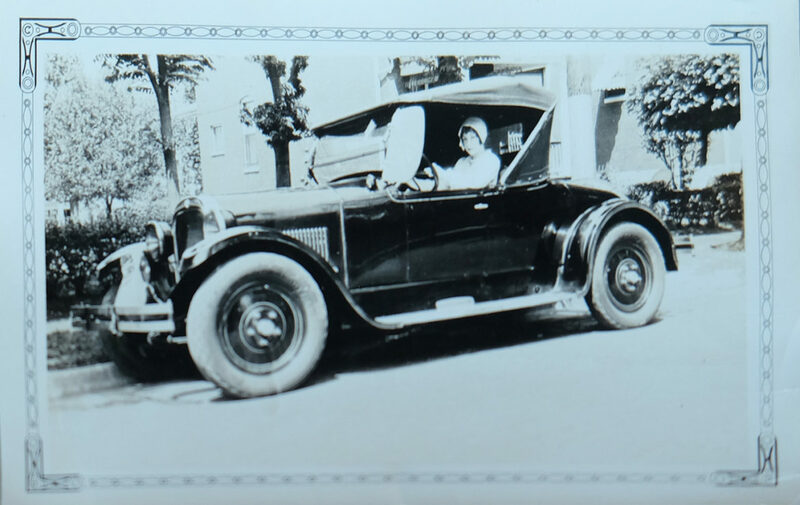 This image of Uncle Bud with his fancy car was definitely made on Commonwealth. Notice the gas light behind the car. This is the first one that I can recall seeing in an old photograph. These may have been only in the City of St. Louis. Jean wasn’t sure I’d be interested in these Commonwealth photos because they were just across the border from Maplewood. True Maplewoodites know Maplewood is a state of mind. Our border on the east should be McCausland and the River Des Peres. 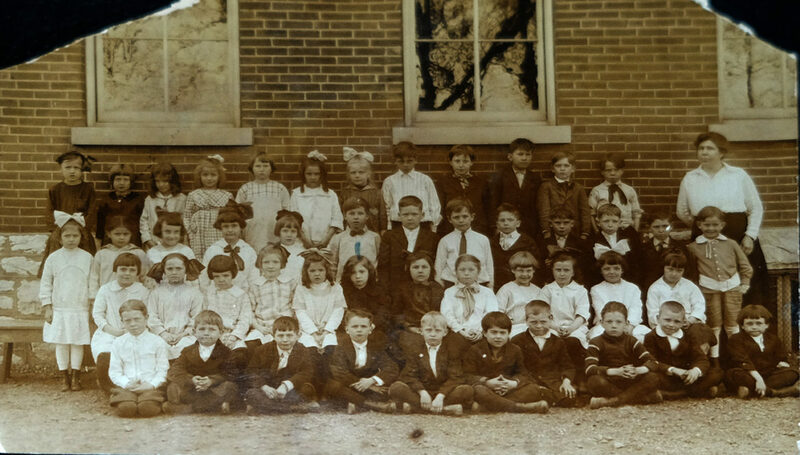 A Valley School class photo. Valley School was once located directly across Manchester from our present city hall. This is a cute one. 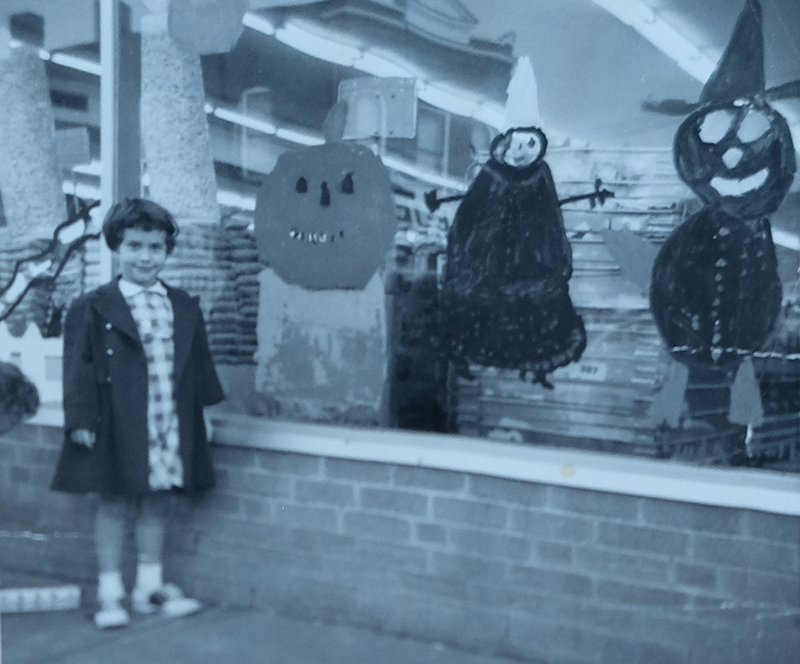 This is Jean’s Halloween window in 1957. She had an early inclination towards graffiti. Just kidding. Much thanks to Larry and Jean for allowing us this look into our past. Doug, Doug is correct. The 7584 Hazel Ave. address is an error and the Wiss family lived in two Maplewood houses, both now demolished. I spent a wild Friday nite going through some of the US census data for the people on7400 block of Hazel Ave and was able to make a few surprising connections. First, the correct address for the house Floyd and Emma Wiss lived in is 7485 Hazel Ave. This was the second to last house on the North West end of the 7400 block of Hazel. 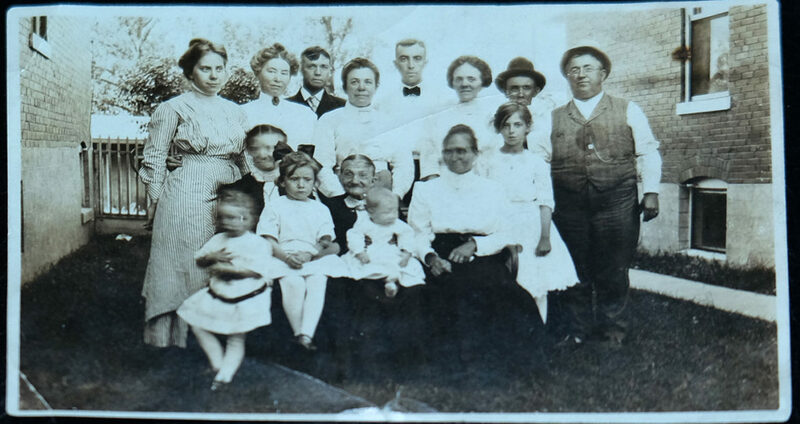 Floyd died in 1914 but Emma and 4 generations of Wiss family can be found living in the house up through the 1940 US Census (the most recent US Census available to the public). The 1910 US Census shows that Floyd’s parents Frank and Sarah Virginia Wiss (aka Jennie) owned 7489 Hazel Ave. This was the last house on the north side of Hazel Ave. and previously made an appearance in Doug H.’s story about the Kalb family. It is in the background behind the second photo with the two young Kalb kids and the third photo with the girl and dog (see link below). Frank and Jennie Wiss moved to North County by the 1920 US Census. The Wiss family has a burial plot in Oak Hill Cemetery in Kirkwood. The family headstone interestingly has the Masonic symbol carved into it (these Hazel Ave houses had the Maplewood Masonic Temple just to the North). 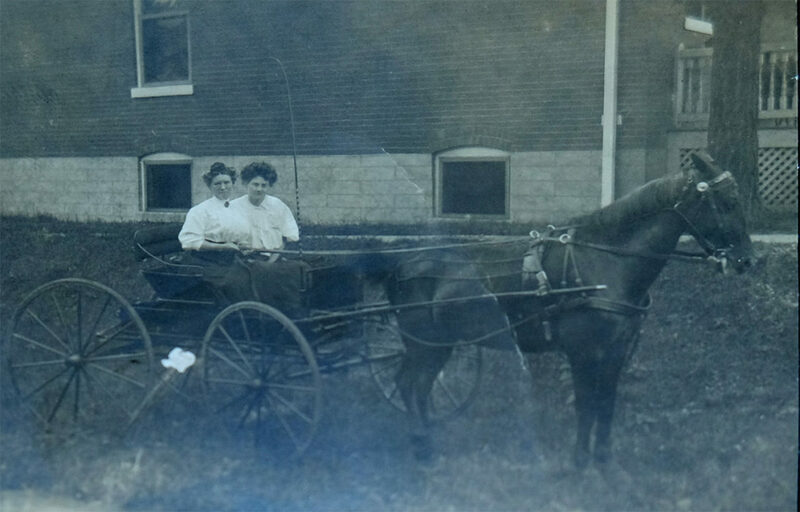 Sally Pare in the horse photo, is probably the same person as “Salie Parr” in the 1910 US Census. 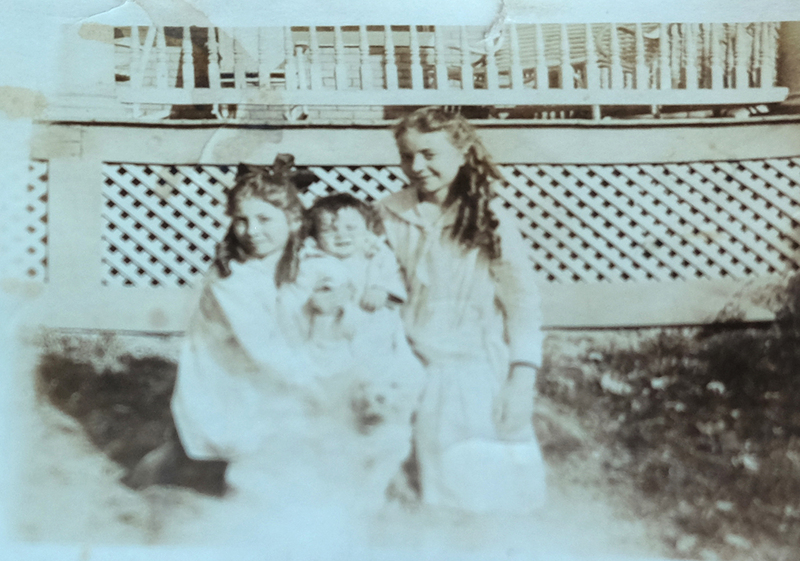 Sallie lived with her brother Walter Parr and two sisters Maggie and Cora in 7461 Hazel Ave. The 1910 US Census showed Walter owned the house free and clear. 7461 Hazel Ave still exists today as the last (and only) house on the North West end of the block. 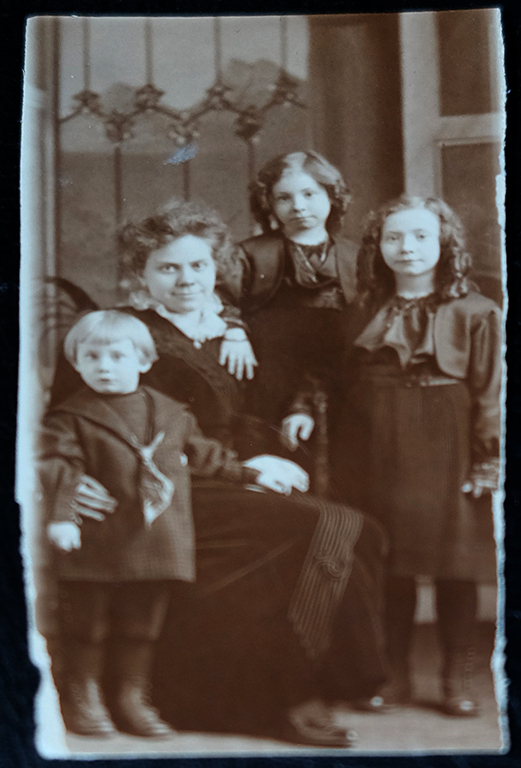 The photo of the 4 ladies with 4 kids shows a “Joesphine W. Huff”. 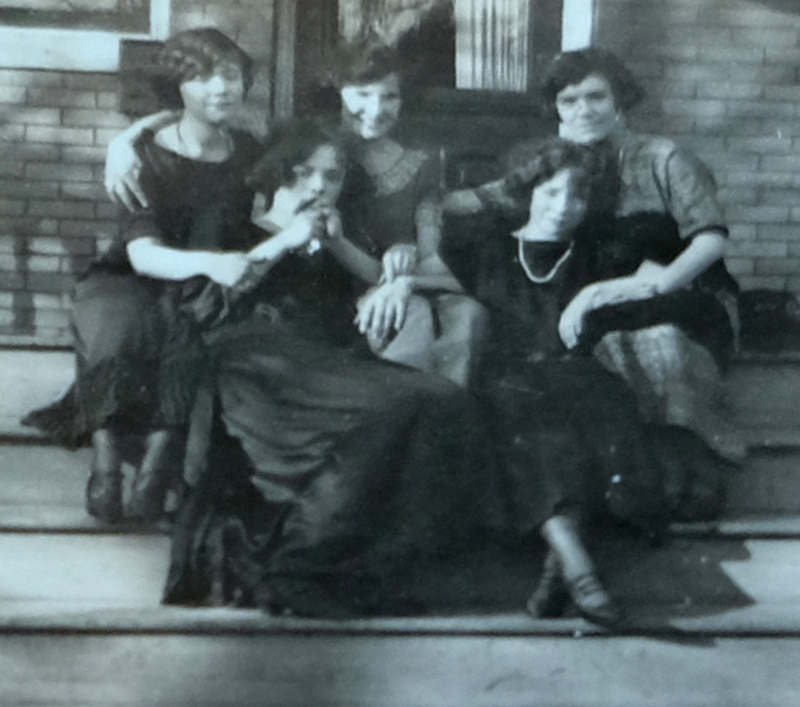 The 1920 US Census has Josephine Huff living with her husband Arthur L. and three kids (Virginia, Arthur, and Chas) in the duplex (now single family) house at 7423 Hazel Ave. They owned the house with a mortgage. Arthur was an accountant for the Pullman Co. which was the same company a number of the Wiss family members also worked at. Wow, Dave. You’ve done it all. Very impressive! I know the Wiss family descendants will be happy to read your research. We always tend to accept the information written on old photos as being accurate. You’ve shown that it is not necessarily true. Much thanks for your hard work on this one. 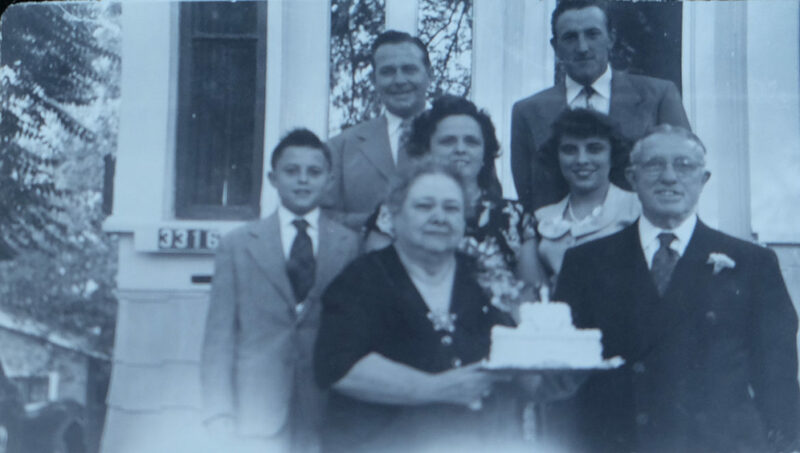 Now you wouldn’t be able to track down the descendants of the Bartold family, would you? I’d add a smiley face here except they are a little too cute for me. Very good, Gary Wiss – Jean’s brother. Thanks, Gary. Nice to have some affirmation from the family. I’m glad you like it. Great photos! I enjoyed reading this post. Thank you, Brenna. It’s always good to hear from you. After doing a bit more research on this I can confidently say that I don’t know what the answers to your questions are. 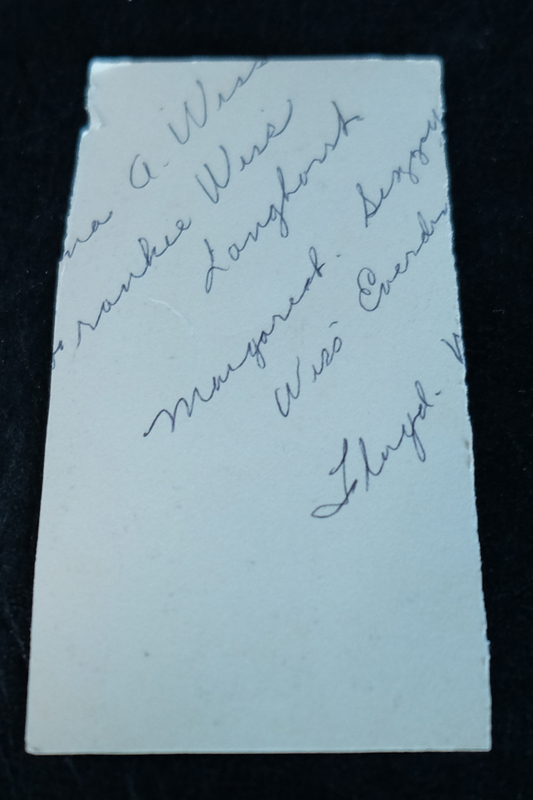 As for the postcard, it looks like it was never mailed. I have no idea what that means but perhaps the 7589 street number is incorrect. And thanks for the welcome back. I blew this one. The postcard has the 7489 address not 7589. Doug, I was trying to place this now-gone house on 7584 Hazel and realized that Hazel Ave now ends at the 7400 block to the west. Any ideas? BTW, I also love imagining these families who preceded us in Maplewood. Great photos here! And can I add that we’re all grateful your computer woes are (mostly) over. 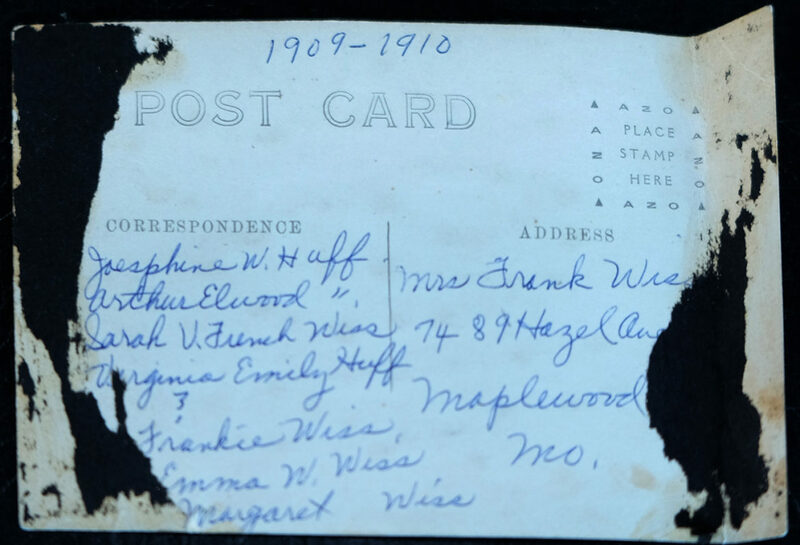 — More on the address: on another photo a postcard is sent to 7489 Hazel, so there must have been more than one move.